Although it’s December and the Christmas season has fully arrived, it’s also autumn where we live. 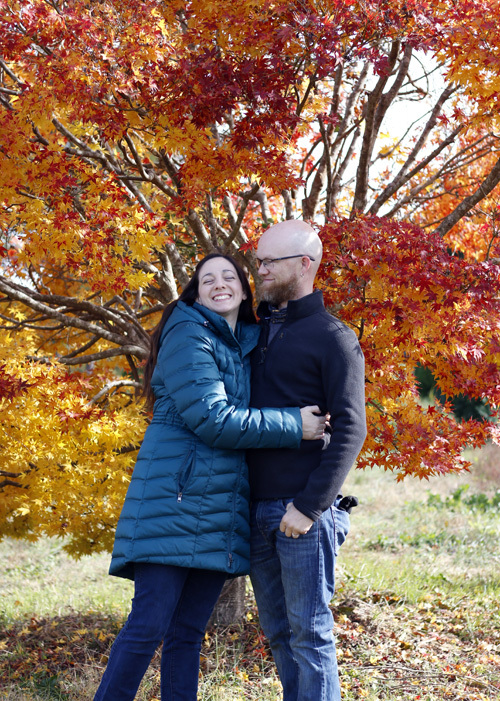 Case in point - this silly picture of Brandon and I, which Liam snapped at the Christmas tree farm. Sure, it’s not exactly the kind of tree we were hunting for, but it was surely the loveliest there. Remember this stack of fabric that arrived so serendipitously from Fiddlehead Artisan Supply? I’ve been anticipating working with it. Isn’t it almost a mirror of the seasonal splendor outside? I’ve decided to make it into a Starbright Stars quilt. That’s one of my favorite Stitched in Color patterns and also happens to be part of Angled class (encoring early next year!). It’s machine sewn with totally normal straight seams. One the left is my first version, scrappy and bright. At right is a monochromatic Starbright Stars, which I made with Love circle a few years ago. I’ve also created a miniature wall edition, which hangs I my kitchen. Yep, I love this pattern! 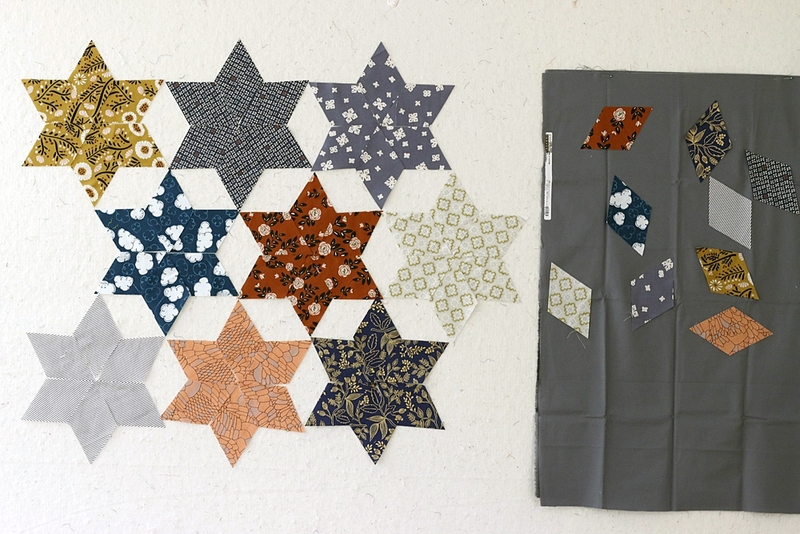 This new version is going to have whole stars made all of one fabric, instead of the scrappy look. 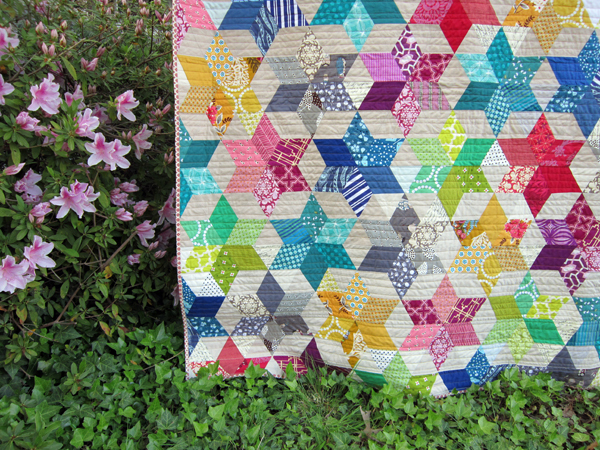 I think this will be a nice way to showcase the prints in my inspiration fabric stack. After cutting some star diamonds, I auditioned background fabric possibilities. The yellow feels soft and cheery, vaguely summery. Maybe if it weren’t fall, I’d opt for that. The tan feels very neutral. I like it, but it doesn’t have the dramatic vibe of the fabric stack photo. That’s when I pulled out my solid swatch cards. I’m so glad I have these! I decided that Kona Coal was ok, but something a tad darker might be even better. Freespirit Manatee seemed right! I also ordered Freespirit Raven, just in case. By the time the new solid fabrics arrived, I had had an epiphany. Why not multiple background colors? Yes! Today I’m prepping background triangles in three different solid grays and a few tone-on-tone solid prints. I’m eager to sew them together and see how it will look!